In a melancholy mood, a young woman is holding a love letter with her teeth and her hand. The motif on her kimono and the bouquet of chrysanthemums indicate the autumn and, metaphorically, also the fleeting nature of love. What is unusual and new about this composition, in which the tree and the woman’s body overlap, is that images of man and nature are so closely intertwined. From 1715 Masanobu clearly became ever more free of the influence of the Kaigetsudō school and the masters of the first Torii generation. Their depiction of statuesque, mature women had dominated Japanese woodblock art in the first decade of the 18th c. In fact, right up to the turn of the 19th c. this almost architectural severity was considered the appropriate manner in which to portray the well-paid, seemingly unapproachable courtesans who were the target of all male longings in Japanese middle-class society during the Tokugawa period. The leaf is in many ways unusual for its time. This applies particularly to the composition, which is based, formally speaking, on two lines of movement which cut across each other diagonally where the body of the young oiran and the trunk of the willow tree intersect. 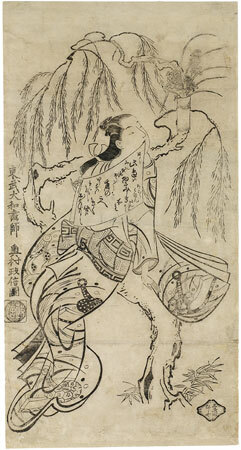 The diagonal created by the tree trunk is extended beyond the figure of the oiran by the lines of her obi. In the other direction, the upper margin of the calligraphy forms a bridge linking the drunk to the crown of the tree which, above the figure of the oiran, surrounds her head like a garland as she looks back. Thus, the impression is created of an interweaving of human figure and nature which could hardly be more removed from the traditional, statuesque monumentality of the old school. The girl is young and maintains a sorrowful pose – which, however, also seems a little mannered. Between her teeth she holds a love letter by the corner, and rolls it out with her hand. The lines of the three groups of word are arranged at an angle from upper left to lower right instead of vertically. The middle group is clearly written in bolder characters (and therefore in capitals in the translation). AT THIS PLACE I endure. The kimono is decorated with autumnal grasses and dewdrops. Stirrups (abumi) are dispersed in the grasses. Everything serves to indicate that autumn and that the young courtesan and her absent lover are lamenting the passing summer. The bunch of chrysanthemums in the bamboo case could represent the chrysanthemum crest of herself, or of the brothel where she was working. This detail is not integrated into the composition as a whole and is not stylized.